Mount Luyendyk, named for UC Santa Barbara professor emeritus Bruce Luyendyk. It’s not every day you get a mountain named in your honor. But UC Santa Barbara’s Bruce Luyendyk, a professor emeritus of earth science, can claim exactly that rare accolade. 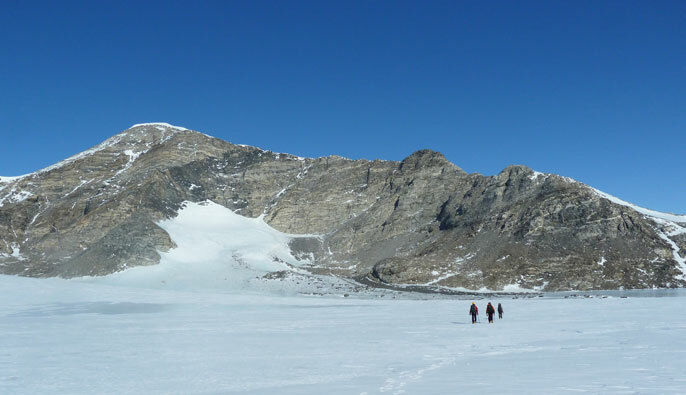 Mount Luyendyk, as the peak is now known, is situated in Antarctica’s remote Fosdick Mountains, a place the tectonics expert knows well from his years conducting field research there. It was two of Luyendyk’s former Ph.D. students, Christine Siddoway and Chris Sorlien, who proposed the commemorative name, which the U.S. Board on Geographic Names (BGN) officially adopted January 19. “Fundamentally, it is Bruce’s research contributions to West Antarctica and science advocacy over 25 years that make him deserving of a place name designation,” said Siddoway. Spending six weeks living in an 8-foot-by-8-foot tent in one of the most isolated parts of the earth tends to bring camaraderie and challenges in equal measures. Siddoway and Luyendyk remember the trip fondly, though at the time Mother Nature had her own ideas. So, Bruce Luyendyk not only has a mountain named after him, but he knows how it got there. He said that he has no current plans to visit his mountain, but if he did make the long journey to Mount Luyendyk, he would plant a flag featuring the UC Santa Barbara wave on its summit. “I’d love to go back, but that’s for young people,” Luyendyk chuckled.